Approximately 18-30 million adults suffer from sleep apnea. Obstructive sleep apnea (OSA) is serious health condition that affects your sleep, health and quality of life. If you or a loved one has OSA, uses a CPAP, or has symptoms such as snoring, excessive daytime sleepiness or pauses in breathing while sleeping, treatment is essential. During sleep, muscles that control the tongue and throat relax. 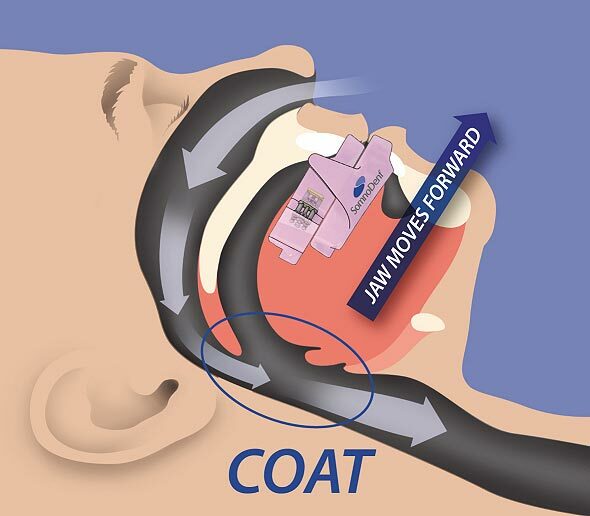 The soft tissue at the back of your throat can sag, which narrows and constricts the airway. Most sufferers can experience hundreds of apnea episodes per night, however they are unlikely to remember any of them. Dr. Marion Pilecki has completed an advanced residency program in treating sleep disordered breathing/apnea. She has attended 224 hours of continuing education to enhance her clinical knowledge and skills in sleep medicine. With a thorough exam and working with other medical specialists, Dr. Pilecki can help diagnose sleep apnea and recommend treatment options to best meet your needs. Dental devices are available to treat mild to moderate obstructive sleep apnea. Worn during sleep, a dental appliance fit over the upper and lower teeth. The device slightly moves the lower jaw forward, helping to keep the airway open allowing you to breathe normally. Designed with the discreetness of a night guard or mouthguard, these dental appliances are customized to you and offer comfort and quality. They are safe, silent and clinically effective.